“The workshop made me question, what is an artist? What is the definition of an artist? Are you an artist because you are paid, or are you an artist because you like to draw or paint? 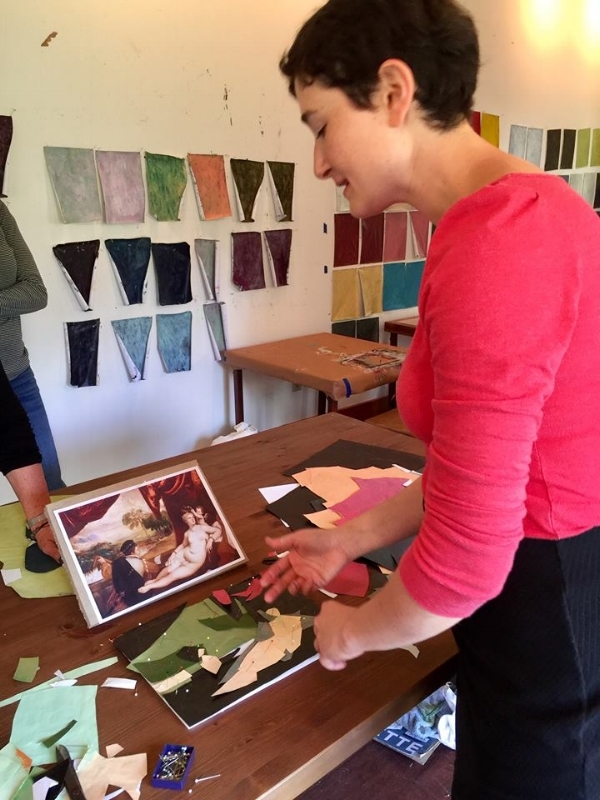 Last Wednesday, I signed up for a weekend collage workshop led by Rotem Amizur, a talented artist from Israel. This workshop was an unbelievable opportunity for me to learn how to do collage. It happened like this: I read about it last week when I saw a link for the workshop on Facebook. The workshop was presented by Art at Kings Oaks in Newtown, PA, not far from my home in New Hope, and it was to take place in a few days: October 13th & 14th. I wasn’t thinking of taking the class; I did not consider myself an artist. So, I “Shared” the link on Facebook in order to spread the word to others. My artist-daughter, Lauren, kept telling me that I should sign up for it. She said, “You can do this, Mom. I know you can do this.” She felt so strongly about it! She kept telling me to register for the workshop. Lauren Kindle (my daughter): Mom, you would love this workshop, you should take it! I wish I could. Lauren Kindle: No need to be anyone but yourself. Lauren (texting): Please do it or I'm going to self-destruct with angst. Lauren (again): The suspense is unbearable. It made me question, why is Lauren saying this? Why is she saying I can do this? My daughter’s positive energy motivated me to sign up; I had no choice, I had to register for the workshop! My painted paper (on the left), from the Rotem Amizur workshop. Registration was very easy using the link. I also called the telephone number to ask if non-artists could enroll, because I would be a collage beginner. “Do you have to be an artist to take this workshop?” I asked. “Is there an opening?” I was told that there was an opening and that I was welcome to register for the workshop. And so, I arrived at Kings Oaks in Newtown, PA, where I was warmly greeted by Clara Weishahn. The first thing I said was: "Sorry I'm late!" And, Clara said: "You are an hour early. Come to the Gallery and take a look at our current group exhibition. Take your time and enjoy. Would you like coffee or tea?" The group exhibition is of 26 artists from across the United States, France, and Israel. I enjoyed viewing the works because the artists' works were very different from one another yet they came together beautifully in a colossal historic barn. It was worth the trip just to look at the barn! There is also a stone chapel on the property; it is lovely! I then met Alex Cohen, an artist/curator and Clara's partner. I gushed over how lovely the exhibit was and that I was looking forward to the workshop. Participants started to arrive and we met the teacher, Rotem Amizur, a beautiful young woman, inside and outside. We went to our classroom; a perfect cozy room with lots of windows and wonderful light. Rotem Amizur leading the art workshop! We were given 14+ sheets of plain printer paper. We were told to paint them in pairs with the same colors; there should be two painted papers with the same color. We should have a mixture of light and dark colors, and, warm and cool tones. We used a 1" brush to paint each paper and supposedly, the first paper would be dry by the time we finished painting the last paper, that is, except for me. I painted them so thickly that Rotem had to get a fan to blow on my papers so that they would dry in time for the next step. Then, we were supposed to paint over the dry painted papers, using their opposite. So, the paper that I painted yellow, a warm color, would be painted over with a cool color such as blue or green. But, I could not paint too thickly, the brush needed to skim over the palette to remove excess paint. The paints need to "breathe" on the paper; that means after I paint the yellow paper a cool color, I should be able to glimpse the yellow under the blue or green paint. People around me were painting very quickly producing many sheets of painted papers. Consequently, they had a huge palette to work from. I was able to do the minimum. This was my first time working with acrylic paints. I could not wait to do the “real” art. However, it was mentioned that preparing these papers was real art, too. Vermeer’s painting: “Girl With a Flute”. Rotem told us to look for the largest areas of dark and lights in our painting reproductions. She said we should identify them and we could call the largest one “Pair One”. Then, look for another pair, and that would be “Pair Two”, and, finally, “Pair Three”. She said paintings could have more pairs but at this stage we would just identify three pairs. A pair would be a dark and a light. We used pins to tack our plain white paper to a piece of foam core. This plain white paper was our "canvas". My girl in the painting was wearing a dark blue dress and I happened to have a very dark blue painted paper. So I used my scissors and cut a piece of the paper. I used pins to attach my cut painted paper to my "canvas". The only cuts allowed were straight cuts. No curves. This was hard to do. I wanted to cut the paper so it looked just like her dress but that was not to be. Straight cuts, only. The dress had highlights in it, so I had to pick one of my colored papers that would be the pair to the very dark blue that I picked for the dress. I would stare at my "canvas" trying to figure out what to do next. Others were working busily and were starting on their second collage. The other participants were more skilled and experienced than me. Rotem kindly told me that if I had time, I could do a second collage, but it was ok to just do one. That took lots of pressure off me. I would spend lots of time just staring at my attempts. So by the end of the first day, my "painting" did not look like anything but a few pieces of cut out papers. So, not only was I an hour early on the first day, I stayed 1.5 hours after the workshop ended, hoping to make progress. I went home and reframed my thinking. I said to myself, “from now on I am going to just work on one area and complete it, then go on to another pairing, and then my final pairing.” I was going to pay attention to what Rotem told us. The next morning, armed with a renewed outlook, I approached my "canvas" and told the Girl With a Flute that I really liked her and we were going to make this work. I told her that there were lots of things that I liked about her, and that I loved her. Rotem said: "Look at your ‘painting’ from a distance. Squint. Look at your ‘painting’ from a distance again." She also advised us to work with the largest areas first. It’s ok to layer your papers. Cut straight lines. Build papers on top of papers to make curves. Each piece of paper is attached to the foam core with the straight pins. So the longer one worked, the more pins in the foam core. After all the papers are pinned to the foam core, one needs to glue them to one another, layer by layer. Just put glue on a small brush and then put glue over the paper and just under the edges. Then, work around the edges of the paper below that, and so on. As the papers are glued, the pins are gently removed. The girl's hat had darks and lights, so I ended up cutting very thin "straight" pieces of paper to help it look lighter. I got into it! And, then, Rotem said: "This is beautiful, Irene. Lets pin it up on the wall with the others." I was not sure it was ready but Rotem said it was. After Rotem pinned "my girl" next to the other finished ‘canvases,’ I almost cried with joy. It looked good. It looked beautiful. It looked really wonderful next to all the other completed collages. I was so happy; I could not stop smiling. Wonderful work by the students in Rotem’s workshop!